This post is by Miriam Wharton, a part-time doctoral student at the Centre for Defence and Security Studies at Massey University in New Zealand. She is writing her thesis on the relational approach within New Zealand Special Operations Forces. She is also employed full-time. I think this post speaks to the rapid collapse of certainty you can feel at the start of a PhD as all your carefully laid plans do not survive contact with reality! Take it away Miriam. All those excellent “How to do a PhD” books provide a linear progression from start to finish. They seem to encompass all the intricacies along the way, but ultimately serve as a sort of telescope that draws your vision towards a clear and cohesive end point where your research question is answered neatly, you wear the gown and funny hat and wield your well-earned testamur. I was so sure the way to do a good PhD is to have it well planned out from the start. I’d lay the groundwork for my research proposal, I’d develop keen research questions that pierced succinctly to the heart of the research topic, and I’d tick my academic, methodological, conceptual, theoretical and content boxes along the way to the end. That’s the way my journey to a PhD began – in my own head. I spent a good four months with my soon-to-be supervisor, honing ideas and research questions in order to get the project through the initial enrolment gate and, I thought, set out a road map to completion that would be clear and easy to follow. I’m now four years into a part-time doctoral degree, and what have I learned so far? That every time I reach for that next milestone, my perspective on the subject shifts. The field of study is full of colour, full of fascinating detail that I want to capture, in a way that’s both interesting and useful. I’m holding the instrument in my hands and peering through the eyepiece and it all looks beautiful. Intricate, but patterned and structured. I sigh in contentment, thinking how well I’ve laid the parameters and direction of my research. How well I have assembled my data and conducted my analysis. And in that moment of complacency, as my body shifts even slightly, the kaleidoscope image shakes, rattles, tumbles…and changes. All of a sudden, I am looking at an image that has the same elements I saw before, but they are in a different position, or a different pattern, or a different set of colours. Perhaps all of a sudden I’m seeing pieces of the image I hadn’t paid attention to before, or even noticed, that seem far more important than they have any right to be. This internal deconstruction and reconstruction of research, of the PhD process itself and its content, is both its beauty and its unexpected challenge. I have discovered how much I enjoy following the process; yes, even the academic paperwork that’s a seemingly endless part of doing a PhD. There’s a little buzz of satisfaction as I mark off each milestone, no matter how small. I also am enjoying the experience of assembling my data, of putting it together and beginning to see the patterns emerge. Those flashes of colour and intricacy are so exciting, even more so when it’s my brain that has put them together and brought them to life. But what I have also found is that almost every new step brings with it a slight change in focus. Most often this is a refinement of perspective or approach, but sometimes it is a quite significant rearrangement of the image I am seeing. That can be a frightening feeling. I become afraid that I’m chasing a loose piece of glass inside the kaleidoscope that has shaken free of the rest of the pattern, and will lead me nowhere productive. I question whether, if I hadn’t managed to understand my subject when I wrote my research proposal, whether I’m not as sophisticated a researcher as I thought I was. Maybe I should go back to Honours or Masters level and re-learn the stuff I’ve obviously not grasped yet! I can list about six shifts so far – some very minor, a couple pretty significant – that have occurred within my research. Honestly, sometimes I’m still a little unsure whether these shifts are bringing me closer to, or further away from, a beautiful kaleidoscopic image that can be fixed and submitted to examiners with confidence. My supervisors would likely counsel me that I’m getting ahead of myself. But when every shift has occurred, it has left me feeling a little bit happier, a little more certain, that I’m on to something good. Each little piece of coloured glass clattering into place brings me closer to a beautiful image that pleases the eye and the brain. Talk about the shifts you are seeing with your supervisors or another trusted and experienced person. Often working through the new angle on your research topic verbally, even if a little vague and unformed at first, can bring new clarity. I am also a big fan of whiteboard brainstorming, where you formulate your new or changing ideas in a visual format. In either approach, I believe the key is to do this in the presence of another person, one capable of asking questions and suggesting new approaches. It’s the tutorial method in a one-on-one setting, essentially, where your ideas are both challenged and encouraged. You are able to go down a rabbit hole to see where it takes you, but in a manner where you can be pulled back before you go too far if it is taking you nowhere productive. Trust your intuition and your prior academic experience. At the postgraduate level, particularly at the doctoral level, you have spent years building up a body of knowledge (of content and process) that, whether you are conscious of it or not, has shaped and honed your abilities as a researcher. I don’t believe that the ‘in-one-ear-out-the-other’ method of learning and retention is ever entirely true. Even if your previous experience has been cursory and haphazard (and that’s unlikely if you’ve made it to postgraduate study), some ideas, methods and techniques will have stuck. Trust yourself. Remain realistic about the scope of your project. While a certain level of demonstrated expertise lies at the heart of postgraduate work and the expectations of examiners, don’t try to be an expert in everything even remotely connected to your research topic. For one thing, you don’t have the time! For another, 100,000 words (or whatever your limit is) shrinks rapidly as you attempt to concisely yet comprehensively cover the pertinent elements of your thesis. If kaleidoscopic shifts begin to expand your scope beyond manageable limits, that is a warning sign. Consult with your supervisors, revisit your original research parameters, and stay away from an overly encyclopaedic approach. Don’t be afraid if you see shifts in focus during your research project. I believe that more often that not these are good and useful experiences within the process that can be managed to produce a better thesis in the end. And who knows, maybe another researcher will come along and turn the kaleidoscope again, causing more shifts and seeing new things from a different perspective in the image you’ve created. That’s the beauty of research. It is also the ongoing challenge and opportunity for the researcher in the middle of a thesis project. During the research process, have you experienced shifts in focus that have caused you concern, or excitement? What are some of the strategies you’ve used to manage those shifts in order to produce a better thesis product? Is losing weight similar to doing your thesis? I needed to read, thankyou so much Miriam! I hear you, Miriam! Faced with my eternal eagerness to go down every rabbit hole I spy, my supervisor reminds me to go back to my research question. It really works. I found your post fascinating and very relevant. 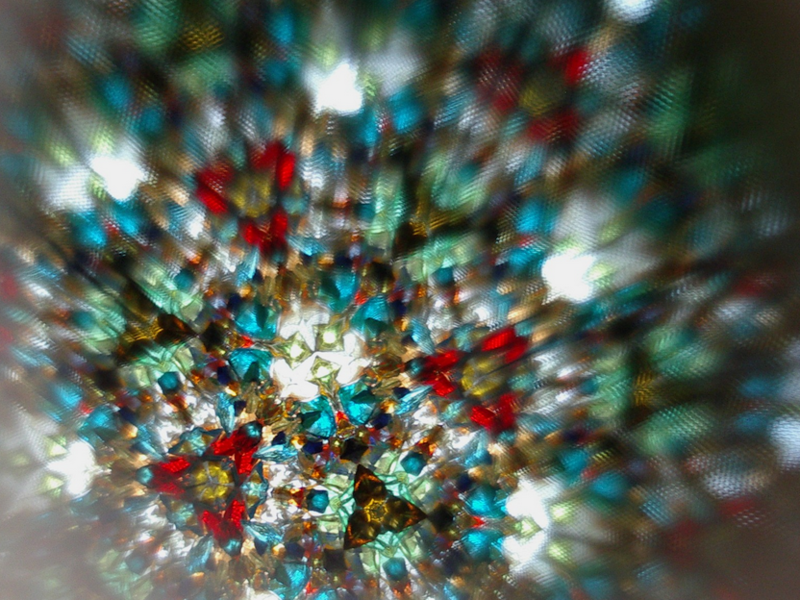 I also chose the kaleidoscope metaphor to describe the epistemology of my PhD study. It helped me conceptualise the ever-changing ‘unfinalised’ ways in which my understandings were evolving. Yes! I just decided to use a kaleidoscope as the theme for my defence presentation. And a fellow doc student just posted how iterative the proposal writing process is! Your post resonates with my experience! I think that kaleidoscope is the right word to describe the Ph.D. paper. The Ph.D. paper has to burst out with the abundance of knowledge. However, sometimes the students have the knowledge but don’t have the skills to put it on paper. In this case, it is better to use the help from the Best Of Writers online and let your Ph.D. paper really show your professional competence. I guess that the chance to consult the online writing services will soon be granted to all graduate students. Thanks for this post. I’m fascinated to hear that your supervisor worked with you for four months prior to enrollment; mine spoke to me for one hour then gave me feedback on my application via email. I’m also puzzled as to how you develop your research questions. Having spent the past few months working on my research proposal (cough, far longer than my supervisor is aware because she advised me NOT to work on it until close to my confirmation date), I was discouraged when my only meeting to discuss my research proposal with my supervisor was to face her as ‘devil’s advocate’ and pseudo examiner instead of as an ally helping me develop the project. The written feedback from my supervisory panel was good in telling me some of what I did wrong in my draft proposal but conflicting advice made responding difficult. In the end, a peer who is close to submission gave me feedback that was helpful and, I hope, resolved some issues. In this kind of situation, where the primary supervisor is more gatekeeper than guide, do you have suggestions to help a research candidate develop this kaleidoscope? Sometimes your peers as research students can perform this role, or there may be another person you know (not necessarily an academic in your field; it could be simply a curious and intelligent person who understands how research works) who can help you ‘think aloud’ about the project and make the shifts (and non-shifts!) you need to make. I agree with the advice in the main article—find someone who can do this for you. DarkMatterzine, it sounds as if your relationship with your supervisor is difficult. PhDs are hard enough without supervisor problems! I spent something like two YEARS with my two, developing my research proposal! They’ve been nothing but supportive through my long (and ever-increasing) part-time research. Can you find another supervisor to work under instead of, or as well as, this one?